So, last week I featured A Bounty of Bead and Wire Earrings to give away, and this week it will be A Bounty of Bead and Wire Necklaces! What do you do after you've mastered stringing? Many of us take up wire and chain, so this volume is perfect for those who are ready to expand a bit. There are a lot of asymmetrical designs included, which will help you train your eye as you read through it. There is a wide range of materials featured by the designers, and the sizes of different pieces are given so that you can substitute items as you please. Once again, I am disappointed that there is no suppliers list for the most crucial pieces needed, but at least you will have the sizes. Some of the pieces use store-bought chain, but some of them feature make-your-own chains, which is really really cool! So hang on! Next week I'll be featuring Bounty of Bead and Wire Bracelets for giveaway! Please make sure that your link will lead me to an email address, or else I won't be able to contact you. No contact, no win, and I simply have to go on to the next person. Deadline: December 19. 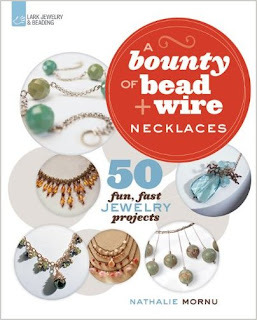 Thanx for a chance to win this book.I like working with wire. Hi Cyndi, I tweeted about your free book giveaway. Looks like an interesting book. Would love to win it. Another great book giveaway! I'm loving the book I won previously, so is it crazy to hope for another? Probably. I would love to win the necklaces book! I would love a chance to win this book, so pretty please count me in! Thanks! Wire+ jewelry+ book???? Count me in for the chance to win it! I am always looking for new ideas and challenges when doing wire necklaces. Having a book like that would be great! Thanks for the chance. I would love to win this book. Please, count me in.